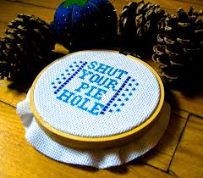 I recently found myself trapped in car with a bunch of chatty eight-year-olds who questioned the origin of shut your piehole (shut your mouth). And no, I didn’t yell this phrase at them. They didn’t question the meaning of the phrase; they specifically wanted to know why the word pie was used instead of some other culinary treasure, like pizza, bacon, tater tots, or donuts. After listening to some zany theories, I decided to look into the etymology. According to The Phrase Finder, the phrase shut your cakehole originated in the UK in the 20th century but is now considered archaic. Americans started using the equivalent, shut your piehole, in the ‘80s. It is unknown if piehole originated from cakehole.